JZL184 and MJN110 reverse CCI-induced allodynia and thermal hyperalgesia in dose-related fashions at their optimal time points, which were 3 hours and 1 hour, respectively. Von Frey filaments were used to test mechanical allodynia in the ipsilateral paw (A) and contralateral paw (B). Immediately after allodynia assessment, thermal hyperalgesia was assessed in the hotplate assay (C). Filled symbols denote significance from CCI + vehicle. Data reflect mean ± S.E.M., n = 5–7 mice per group. The antiallodynic and antithermal hyperalgesic effects of MAGL inhibitors are differentially altered by blockade of CB1 and CB2 receptors. 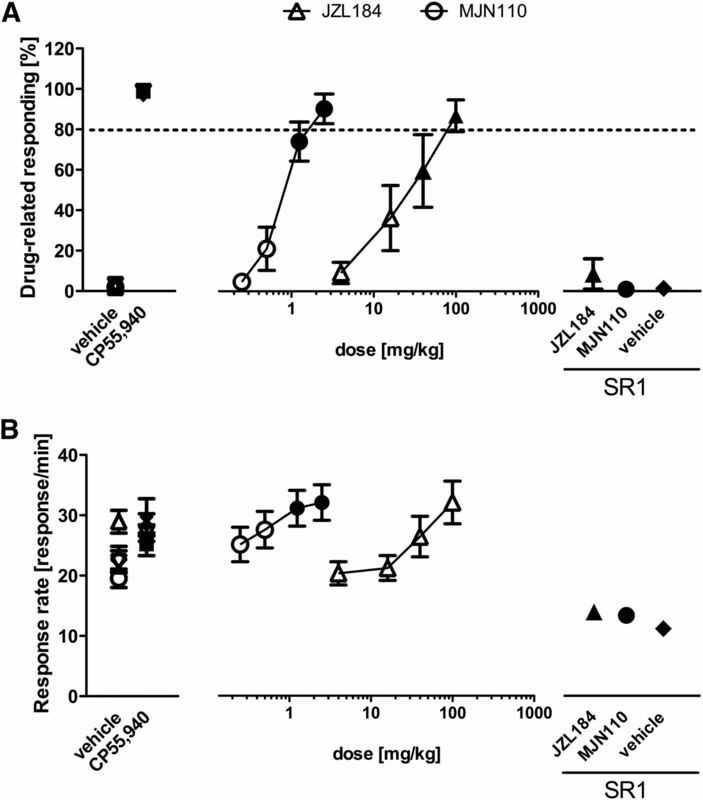 Rimonabant (SR1) and SR144528 (SR2) block the antiallodynic effects of (A) JZL184 (40 mg/kg), and (B) MJN110 (1.25 mg/kg). (C) Rimonabant (3 mg/kg), but not SR144528 (3 mg/kg), blocks the antithermal hyperalgesic effects of 40 mg/kg i.p. JZL184. (D) Rimonabant, but not SR144528, blocks the antithermal hyperalgesic effects of MJN110 (1.25 mg/kg). Ipsilateral paw data are displayed for only (A) and (B). ***P < 0.0001; *P < 0.05 versus CCI vehicle + vehicle; ###P < 0.0001; ##P < 0.001; #P < 0.05 versus CCI vehicle + MAGL inhibitor. Data reflect mean ± S.E.M., n = 5–7 mice per group. Horizontal lines spanning across the ordinates reflect sham values (top lines) and CCI values (bottom lines). MAGL inhibition with JZL184 (4, 16, 40, 100 mg/kg, n = 7 mice per dose) and MJN110 (0.25, 0.5, 1.25, 2.5 mg/kg, n = 9 mice per dose) produced dose-related substitution for the potent, synthetic cannabinoid receptor agonist CP55,940 in mice trained to discriminate CP55,940 from vehicle (A). Rimonabant (SR1; 1 mg/kg) blocked substitution produced by JZL184 (40 mg/kg) and MJN110 (2.5 mg/kg) (A). JZL184 did not produce significant changes in the response rates, whereas MJN110 at high doses increased the response rates (B). Rimonabant produced significant decrease in the response rates. 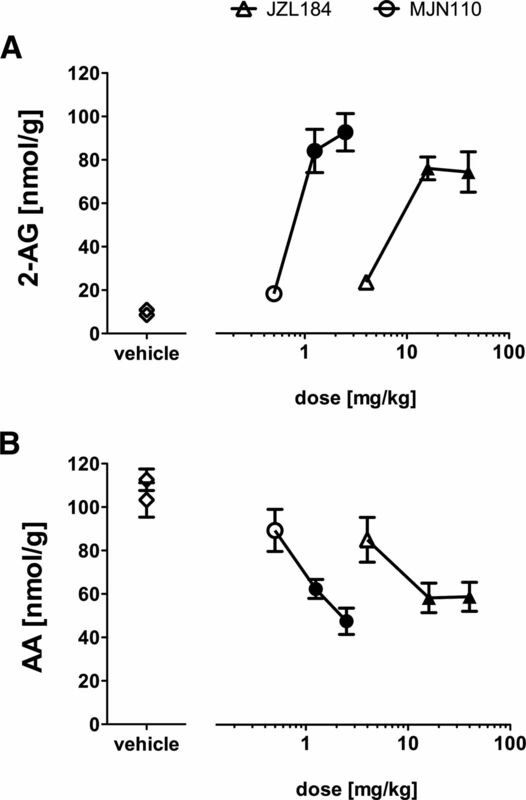 Significant changes compared with vehicle-treated mice are denoted as filled symbols (P < 0.05). Data are shown as mean ± S.E.M. The MAGL inhibitors JZL184 and MJN110 elicit bidirectional effects on the locomotor activity of mice. JZL184 (16 and 40 mg/kg) produced significant decreases in distance traveled (A) and time spent mobile (B), but they did not affect average running speed (C). MJN110 (1.25 and 2.5 mg/kg) increased running speed (C) and distance traveled (A), but time mobile was unaffected (B). Filled symbols denote significance from vehicle (P < 0.05). Data are shown as mean ± S.E.M., n = 7–13. 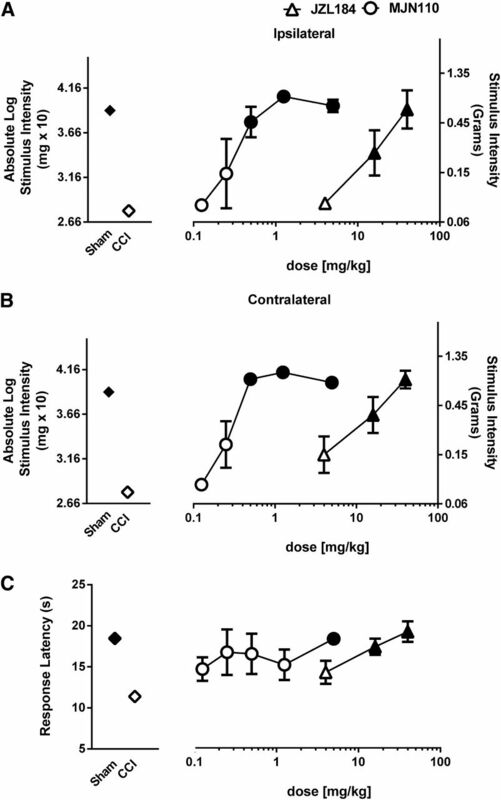 JZL184 (4, 16, 40 mg/kg) and MJN110 (0.25, 1.25, 2.5, 5 mg/kg) produced significant increases in 2-arachidonoylglycerol (2-AG) concentration (A) and concomitant reductions in arachidonic acid (AA) levels (B) in the whole brain of mice. Significant changes compared with vehicle-treated mice are marked with filled symbols (P < 0.01). Data are shown as mean ± S.E.M., n = 7 to 8 mouse brains per group. Supplemental Data - supplemental methods, results, and 7 figures.